Lesotho, officially the Kingdom of Lesotho, is a landlocked country entirely surrounded by South Africa. The name Lesotho roughly translates into "the land of the people who speak Sotho." It is often called “the roof of Africa,” since the rugged land ranges from five thousand feet in the western lowlands to more than eleven thousand feet in the majestic Maloti Mountains, which cover the majority of the country and form the northeastern arc of Lesotho's circumferential boundary with South Africa. Despite the beauty of the land, poverty is on the increase, closely linked to a lack of income and employment opportunities, as well as severe land degradation. About 70 percent of the people live in rural areas, where more than half the population is poor. They live on what they can produce on small plots of land. Many areas are accessible only by horseback or light plane. Forty years of military junta, coup d'état and guerrilla warfare have taken its toll. In the early twenty-first century Lesotho began experiencing a turnaround. A ceremonial monarchy was in place, the military had retired from political involvement, and two peaceful—if not compeltely trouble-free—elections had been held. Its natural beauty is leading to the creation of a tourism industry. Lesotho is working jointly with South Africa in the preservation and promotion of the Maloti/Drakensberg mountain range. 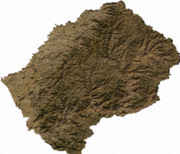 Lesotho can be roughly divided into three geographic regions: the lowlands, following the southern banks of the Caledon River, and in the Senqu river valley; the highlands formed by the Drakensberg and Maloti mountain ranges in the east and central parts of the country; and the foothills that form a divide between the lowlands and the highlands. 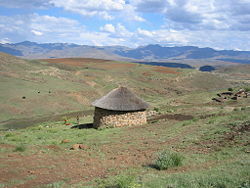 Lesotho is the only independent state in the world that lies entirely above 3,300 feet above sea level (1,000 meters). The lowest elevation in the country is at the junction of the Makhaleng and Orange (Senqu) rivers near the South African border, which at 1,400 meters (4,600 ft) is the highest lowest point of any country. 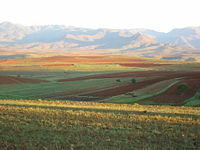 The highest point is the peak of the Thabana Ntlenyana mountain, which reaches an elevation of 3,482 meters (11,420 ft). Over 80 percent of Lesotho lies above 1,800 meters (5,900 ft). Due to its altitude, Lesotho remains cool throughout the year. Most of the rain falls as summer thunderstorms. Maseru and surrounding lowlands often reach 30 °C (86 °F) in summer. Winters can be cold with the lowlands getting down to -7 °C (19 °F) and the highlands to -18 °C (0 °F) at times. Snow is common in the deserts and low valleys between May and September; the higher peaks can experience snowfall year-round. The Maloti Mountains are found in the highlands of Lesotho and named the Drakensberg in South Africa. They form a high alpine basalt plateau up to 3,400 meters in height. The highest point is Thabana Ntlenyana (3,482 meters) in the northeast. Snow and frost may be found even in summer on the highest peaks. 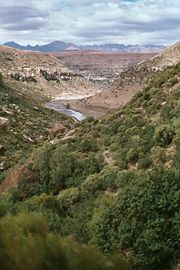 The sources of two of the principal rivers in South Africa, the Orange River and the Tugela River, are in these mountains. Tributaries of the Caledon River, which forms the country's western border, also rise here. The earliest inhabitants of the mountainous area were Khoisan hunter-gatherers who were largely replaced by the waves of Bantu-speaking tribes that migrated from east and central Africa during the seventeenth century. The two ethnic groups intermarried and became known as the Basutos, or Basothos. Formerly Basutoland, the present Lesotho emerged as a state under paramount chief Moshoeshoe I in 1822 as a mountain fastness defensible against the Zulu mfecane; it was recognized by Britain in 1843 and became the High Commission Territories in 1868. Granted autonomy in 1965, its name changed when Lesotho gained full independence from the United Kingdom on October 4, 1966. In January 1970, the ruling Basotho National Party (BNP) lost the first post-independence general elections. Prime Minister Leabua Jonathan refused to cede power, declared himself Tono Kholo (prime minister), and imprisoned the Basutoland Congress Party leadership remaining in the country. The BCP launched the guerrilla war with a handful of old weapons. The main force was defeated in northern Lesotho and later guerrillas launched sporadic but usually ineffectual attacks. In the early 1980s, several Basotho who sympathized with the exiled BCP were threatened with death and attacked by the government of Leabua Jonathan. The BNP continued to rule by decree until a January 1986 coup. The military council that came to power granted executive powers to King Moshoeshoe II, who was until then a ceremonial monarch. In 1987 the king was forced into exile after a falling out with the army. His son was installed as King Letsie III. The chairman of the military junta was ousted in 1991 and replaced by an officer who handed over power to a democratically elected government of the BCP in 1993. Moshoeshoe II returned from exile in 1992 as an ordinary citizen. After the return to democratic government, King Letsie III tried unsuccessfully to persuade the BCP government to reinstate his father (Moshoeshoe II) as head of state. In August 1994, Letsie III staged a coup backed by the military and deposed the BCP government. The new government did not receive full international recognition. Member states of the Southern African Development Community (SADC) engaged in negotiations to reinstate the BCP government. One of the conditions Letsie III put forward for this was that his father should be re-installed as head of state. After protracted negotiations, the BCP government was reinstated and Letsie III abdicated in favor of his father in 1995, but Moshoeshoe II died in a car accident in 1996 and was again succeeded by his son. In 1997 the ruling BCP split over leadership disputes. Prime Minister Ntsu Mokhehle formed a new party, the Lesotho Congress for Democracy (LCD), and was followed by a majority of Members of Parliament, which enabled him to form a new government. Pakalitha Mosisili succeeded Mokhehle as party leader and the LCD won the general elections in 1998. Although the elections were pronounced free and fair by local and international observers and a subsequent special commission appointed by SADC, the opposition political parties rejected the results. Opposition protests in the country intensified, culminating in a peaceful demonstration outside the royal palace in August 2000. Exact details of what followed are greatly disputed and remain contested even within South Africa, but in September that year, a SADC task force operating on orders of unclear provenance entered the capital Maseru. While the Botswana Defense Force troops were welcomed, tensions with South African National Defense Force troops were high, resulting in fighting. Incidents of sporadic rioting intensified when South African troops hoisted a South African flag over the royal palace. By the time the SADC forces withdrew in May 1999, much of Maseru lay in ruins, and the southern provincial capital towns of Mafeteng and Mohale's Hoek had seen the loss of over a third of their commercial real estate. A number of South Africans and Sothos also died in the fighting. An Interim Political Authority (IPA), charged with reviewing the electoral structure in the country, was created in December 1998. The IPA devised a proportional electoral system to ensure that the opposition would be represented in the National Assembly. The new system retained the existing 80 elected Assembly seats but added 40 seats to be filled on a proportional basis. Elections were held under this new system in May 2002, and the LCD won again, gaining 54 percent of the vote. But for the first time, opposition political parties won significant numbers of seats, and despite some irregularities and threats of violence, Lesotho experienced its first peaceful election. The Lesotho Government is a constitutional monarchy. The prime minister, Pakalitha Bethuel Mosisili, is head of government and has executive authority. The king serves a largely ceremonial function; he no longer possesses any executive authority and is proscribed from actively participating in political initiatives. In polling that was declared "credible, free and fair," the LCD was declared the winner of the snap February 2007 general elections, winning in 61 of the directly contested constituencies. Its main challenger, the All Basotho Convention (ABC), came second with 17 seats, and the Alliance of Congress Parties (ACP) got one seat. The ABC was formed in October 2006 by former communications minister Thomas Thabane, who, together with 18 other parliamentarians, resigned from the LCD government after complaining of non-delivery. Under the proportional representation system, the LCD picked up additional seats, giving it more than 75 percent of the 120 seats in the lower house of parliament. The upper house, called the Senate, is composed of 22 principal chiefs whose membership is hereditary, and eleven appointees of the king, acting on the advice of the prime minister. The constitution protects basic civil liberties, including freedom of speech, freedom of association, freedom of the press, freedom of peaceful assembly, and freedom of religion. 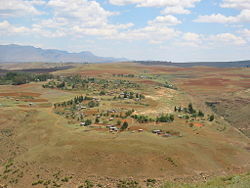 Administratively, Lesotho is divided into ten districts, each headed by a district administrator. Each district has a capital known as a camptown. The districts are further subdivided into wards, which are presided over by hereditary chiefs and administered by various local government structures whose nature depends on whether the ward is in an urban or rural area. Lesotho's geographic location makes it extremely vulnerable to political and economic developments in South Africa. It is a member of many regional economic organizations including the Southern African Development Community (SADC) and the Southern African Customs Union (SACU). It is also active in the United Nations (UN), the African Union, the Non-Aligned Movement, the Commonwealth of Nations, and many other international organizations. Historically, Lesotho has maintained generally close ties with the United Kingdom (Wales in particular), Germany, the United States and other Western states. In the past, it was a strong public supporter of the end of apartheid in South Africa and granted political asylum to a number of South African refugees during the apartheid era. Lesotho's economy is based on exports of water and electricity sold to South Africa, manufacturing, agriculture, livestock, and to some extent the earnings of laborers employed in South Africa. Lesotho also exports diamonds, wool, mohair, clothing, and footwear. Lesotho is geographically surrounded by South Africa and economically integrated with it as well. The majority of households subsist on farming or migrant labor, primarily miners who remain in South Africa for three to nine months. The western lowlands form the main agricultural zone. Almost 50 percent of the population earns some income through crop cultivation or animal husbandry, with over half the country's income coming from the agricultural sector. Most small-scale farmers do not have the labor and capital they need to use their land productively. Because of traditional land tenure practices, reliance on rainfed farming and poor crop husbandry methods, yields are low. Farmers have little or no access to credit, draft animal power, or inputs such as seed and fertilizer. Water is Lesotho's only significant natural resource. It is exploited through the 20-year, multibillion-dollar Lesotho Highlands Water Project (LHWP), which began in 1986. The LHWP is designed to capture, store, and transfer water from the Orange River system to South Africa's Free State and greater Johannesburg area, which features a large concentration of South African industry, population, and agriculture. Completion of the first phase of the project has made Lesotho almost completely self-sufficient in the production of electricity and generated approximately $24 million annually from the sale of electricity and water to South Africa. The World Bank, African Development Bank, European Investment Bank, and many other bilateral donors financed the project. Lesotho has taken advantage of the African Growth and Opportunity Act (AGOA) to become the largest exporter of garments to the United States from sub-Saharan Africa. Exports totaled over $320 million in 2002. Employment reached over fifty thousand, marking the first time that manufacturing sector workers outnumbered government employees. Asian investors own most factories. Lesotho is a member of the Southern African Customs Union (SACU), in which tariffs have been eliminated on the trade of goods with other member countries Botswana, Namibia, South Africa, and Swaziland. Tourism is a slowly growing industry. A ski resort recently opened in the high Maloti Mountains is drawing tourists from South Africa. The growing disparity of income and standards of living forms an ever-widening gap between people in the mountainous areas and those in the lowlands, where more wage employment is available. Some people, especially younger women, have been able to find employment in the country’s new industries, mainly in urban areas. Job creation is critical, but Lesotho has too small a private sector to provide jobs for every person in its labor force. The lack of investment in agriculture, the decline in agricultural production, the lack of income-generating activities, and degradation of natural resources are among the principal causes of rural poverty. HIV/AIDS also takes its toll, and rural people’s scarce resources are consumed in caring for the sick, covering funeral expenses, and supporting orphans. 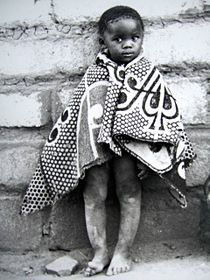 Boy wrapped in a Basotho blanket. More than 99 percent of Lesotho's population is ethnically Basotho. About 80 percent is Christian, with a majority of Roman Catholics. Other religions include Islam, Hinduism, and indigenous beliefs. Education is not compulsory even at the primary level, but about 85 percent of the people are literate, and the government is implementing a program for free primary education through seventh grade. Particularly in rural areas, schools are few and children are involved in subsistence farming and livestock herding, especially boys. Domestic violence and sexual harassment against women are believed to be widespread. Both traditional law and custom severely limited the rights of women in areas such as property rights, inheritance, and contracts. Traditional musical instruments include lekolulo, a kind of flute used by herding boys, setolo-tolo, played by men using their mouth, and the women's stringed thomo. The Morija Arts & Cultural Festival, a prominent Sotho music festival, is held annually in the historical town of Morija, where the first missionaries arrived in 1833. With a shortage of trained personnel and medical supplies, Lesotho is severely afflicted by HIV/AIDS. According to recent estimates, the prevalence is about 29 percent–one of the highest in the world. The United Nations projects that this will rise to 36 percent within fifteen years, resulting in a sharp drop in life expectancy. According to the Lesotho Bureau of Statistics, in 2004 life expectancy was estimated at 36.7 years. Many children have lost parents; they are thus susceptible to being ostracized and to child abuse and often resort to prostitution to survive. There are a growing number of street children. Traditionally lavish funerals leave survivors with another burden. The government of Lesotho was initially slow to recognize the scale of the crisis, and its efforts to date in combating the spread of the disease have had limited success. In 1999 the government finalized its Strategic Plan on HIV/AIDS, a diagram for addressing the education, prevention, counseling, and treatment needs of the populace. In late 2003 the government announced that it was forming a new National AIDS Commission to coordinate society-wide anti-AIDS activities. Also in 2003 the government hosted a SADC Extraordinary Summit on HIV/AIDS. In 2005 and 2006, programs for the distribution of anti-retroviral drugs were initiated, but such programs remain limited in resources and have relatively few participants. The government has also started a proactive program called "Know Your Status" to test for HIV everyone who seeks it, funded by overseas donors. ↑ United Nations, World Population Prospects: The 2008 Revision. Highlights Population Division of the Department of Economic and Social Affairs of the United Nations Secretariat (2009). Retrieved December 6, 2011. ↑ 2.0 2.1 2.2 2.3 Lesotho. International Monetary Fund. Retrieved December 6, 2011. Lesotho – U.S. Department of State. Includes background notes, country study and major reports. Retrieved January 26, 2007. Ngwawi, Joseph. "Lesotho: Elections 'Credible, Free And Fair,' LCD Returned to Power." allAfrica.com. February 21, 2007. Retrieved April 24, 2007. Rural poverty in Lesotho. Rural Poverty Portal. The International Fund for Agricultural Development. Retrieved April 24, 2007. Country profile: Lesotho – BBC.co.uk. Lesotho – CIA World Factbook. 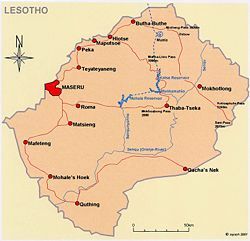 Lesotho Map – U.S. Department of State. This page was last modified on 28 June 2018, at 22:43.